How Much Does Smart Home Tech Actually Save? Smart home technology has come leaps and bounds since it was first introduced and we now live in a world where we can have smoke alarms that talk to us, thermostats that learn, and remote access security devices where you can use your phone to let friends and family into your house. Here at Crescent Electric, we think this is great and wondered just how much smart home technology could save on electric bills yearly. To answer this question, we calculated the average yearly electricity bill for each state using data from the US Energy Information Administration and then looked at smart home thermostats to determine average installation cost and their average savings to come up with a total average and yearly savings by state. The average cost for purchase and installation of smart home thermostats is $799 and they carry a savings of, on average, 24.5% of each state’s electricity bill. 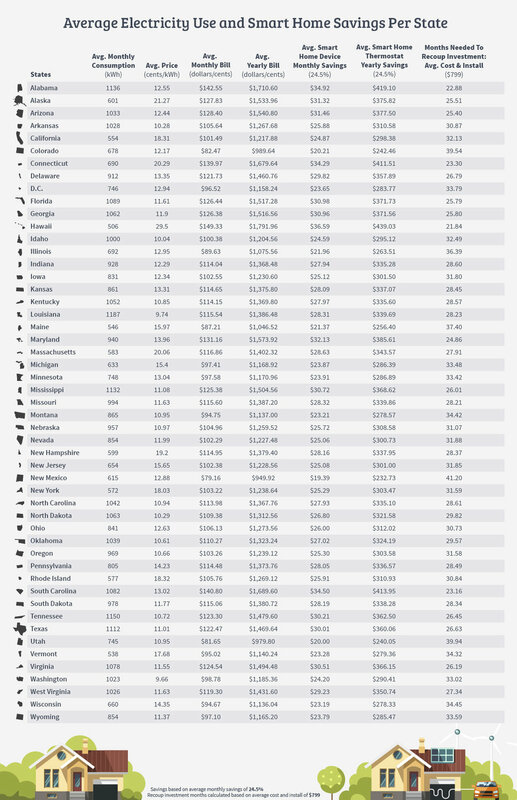 It’s great to see that each state can cover these setup costs through savings generated, which ranges from $439 to $233 a year in a period ranging from 22 to 41 months. On average, thermostats have a lifespan of 10 years, meaning that every state can realize net savings long past recovering the initial average purchase and installation cost. Overall, Hawaii is the state that can benefit from smart home technology the most because it has an average monthly smart home thermostat savings of $37 and a yearly savings of $439. Following closely behind is Alabama with an average monthly smart home thermostat savings of $35 and a yearly savings of $419. Overall, with these top ten states having high savings, the months needed to recoup the investment of the purchase and installation of a smart home thermostat are relatively low, ranging from 22 to 26 months. When we look at states offering the lowest savings, New Mexico offers the least with an average monthly smart home thermostat savings of $19 and a yearly savings of $233. Utah also offers relatively low savings with an average monthly smart home thermostat savings of $20 and a yearly savings of $240. While these states offer the lowest savings, it’s important to note that savings of over $200 per month is still substantial and the months needed to recoup the initial investment for purchase and installation of smart home thermostats range from 41 to 34 months, which is a short time frame compared to a thermostat’s lifespan. So there you have it, Hawaiians are set to save the most using smart home thermostats and New Mexicans the least. Regardless of which state you’re in, it’s clear that smart home technology is the future by generating savings and enhancing energy efficiency, leading to less waste and a more environmentally-friendly world.